Join library advocates from various states as they share their case studies of advocating for libraries on the local, state, and national level. Our guests will discuss their top advocacy tips that you can implement into your daily work practice. This webinar is geared toward library staff who want to more effectively advocate and communicate their library’s value to stakeholders, but aren’t sure where to start. Panelists will include managers and non-managers. This webinar will not review legislation. Learn about tools for advocacy. Have a better understanding of advocacy and how to intentionally advocate for library services and resources. All staff serving children and families. This webinar is organized by members of the Advocacy and Legislation and Managing Children’s Services committees. Although the President’s FY 2017 budget proposal includes level funding for the Institute of Museum and Library Services (IMLS), libraries are still being cut. Funding for the Library Services and Technology Act (LSTA) is cut by over half a million dollars. Keeping LSTA funding at $186.6 million would allow libraries to continue critical programs. The proposed budget does include level funding for Innovative Approaches to Literacy (IAL) at $27 million. The Labor, Health and Human Services Subcommittee of the Senate Appropriations Committee will be working on the IMLS budget mark up as early as next week. Senator Mikulski is a member of this subcommittee. Please take a moment to contact the Senator and ask her to continue her long-standing support of libraries by keeping IAL funding at $27 million and restoring funding to LSTA at $186.6 million. Talk about how the LSTA cut will negatively impact library services. Check out this LSTA handout created by Maryland’s Division of Library Development and Services (DLDS) to see how LSTA funds are used to transform lives statewide. For more information on how to contact Senator Mikulski, go to the American Library Association’s Engage website and click on Send an Email (provides a pre-written letter), Make a Call or Send a Tweet. Can you legally photocopy pages from that textbook? Can students legally remix music for school assignments? What does fair use mean, and how can it be applied in the school library or classroom? If you are a school librarian or educator who is confused by copyright law, you’re not alone. School principals, superintendents, educators and librarians have specific questions about copyright law but often find themselves without guidance on the subject. On January 7, 2014, from 6:00-7:00p.m. EST, school leaders will have the opportunity to have their questions answered during an interactive tweetchat with copyright expert and bestselling author Carrie Russell. 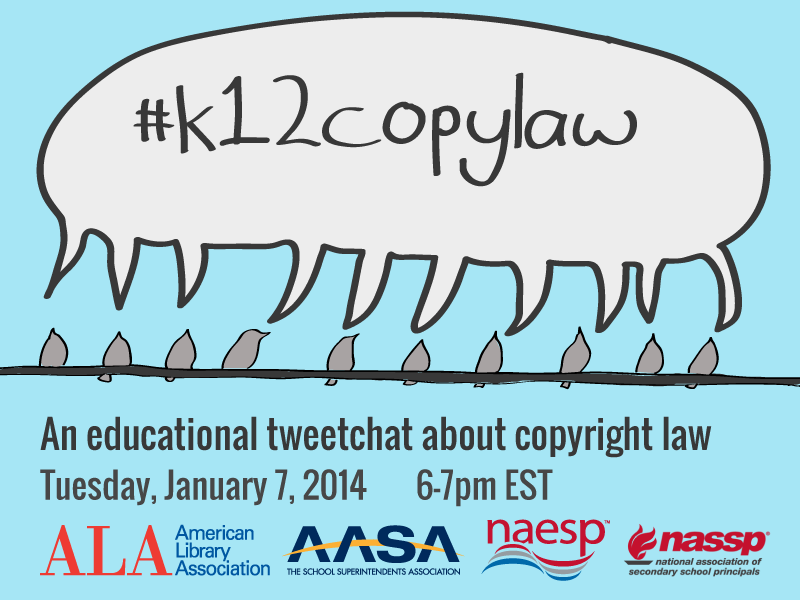 Participants can submit questions and take part in the free tweetchat by using the #k12copylaw hashtag. For more information, please see the District Dispatch post. Effective November 19, 2013, when accessing Thomas.gov, you will be redirected to Congress.gov. Congress.gov has grown since it’s beta release in Fall 2012 through a collaborative effort between the Library of Congress, U.S. Senate, U.S. Representatives, and Government Printing Office (GPO). The new site includes bill status, texts and summaries, direct links from bills to cost estimates from the Congressional Budget Office, Congressional Record, committee reports, legislative process videos and committee profile pages going as far back as the 103rd Congress. The Library of Congress will offer webinar classes on Congress.gov on January 16th, March 11th, and May 15th. To register, complete the seminar form at http://beta.congress.gov/help. Basic help information is also available through this link. The American Library Association (ALA) Washington Office is offering a free webinar on Wednesday, November 13th, 4-5pm. Despite Congress’ lack of popularity, libraries have a huge advantage. Learn how to use that advantage to avoid setbacks and even make great strides forward. Advocacy resources being developed in response to an ALA Washington Office survey will also be reviewed. Registration for this webinar is available online.